Join us at Bow & Arrow Brewing Company on March 19th for a book salon led by NM Evaluators members Kate Cartwright and Nancy Shane. Evaluation Failures highlights reflective practice through powerful examples. 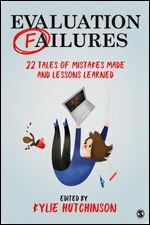 Gather with colleagues, grab a beer (or other beverage of choice), and discuss this collection of real-life stories of failure and learning that are a combination of funny, thought-provoking, relevant, and meaningful. Not able to make it to the in-person salon? Don't worry - we'll be hosting a virtual book club gathering in April! Date and time will be announced soon.